Dec 18 (Reuters) – An Amtrak passenger train derailed on a bridge over a major highway in Washington state on Monday morning, sending part of the train crashing down onto Interstate 5 and killing several passengers, authorities said. A spokesman for the local sheriff’s office, Ed Troyer, told reporters at the scene there were “multiple” deaths but did not have a specific number to report. He also said no motorists were killed, though some were injured when part of the train struck several vehicles. Amtrak passenger Chris Karnes told local news outlet KIRO 7 that passengers were forced to kick out train windows in order to escape, because emergency doors were not functioning properly following the derailment. “The next thing we know, we’re being slammed into the front of our seats, windows are breaking, we stop, and there’s water gushing out of the train. People were screaming,” he added. © Washington Dept. of Transportation Amtrak derailment near Tacoma, Wash. The derailment occurred on the first day that Amtrak trains began using a new route between the cities of Tacoma and Olympia, part of a project to reduce travel time, according to an October news release from the state’s transportation department. The new route takes trains along Interstate 5, eliminating a major choke point for passenger trains in Tacoma and allowing trains to reach speeds of 79 miles per hour (127 km per hour), the department has said. Monday’s train, which was scheduled to depart Seattle at 6 a.m. (1400 GMT) en route to Portland, Oregon, was the first to run along the new route. It was not immediately clear whether the derailment, which came during a busy travel time one week before the Christmas holiday, was connected to the new route. Amtrak confirmed its train was involved and said “some injuries” had been reported but did not immediately offer further details. The train derailed around 7:30 a.m. (1530 GMT) in DuPont. 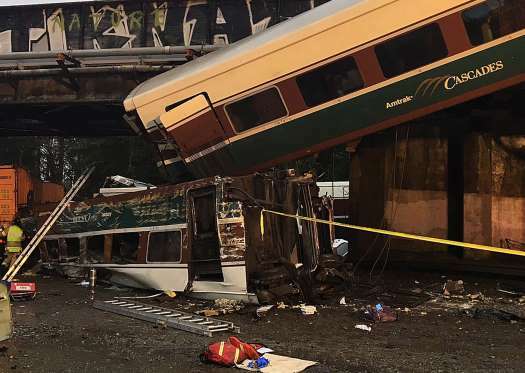 A photograph posted by a Washington State Police spokeswoman showed an upside-down train car partially crushed on the highway, with a second car dangling off the overpass. About 70 people were aboard the train, local news media reported, citing the state transportation department. Authorities warned drivers to avoid the area, and the southbound lanes remained closed. The National Transportation Safety Board said on Twitter that it was gathering information about the incident. “Thank you to the first responders on the scene. We’re praying for everyone on board the train, and ask everyone to hold them in your thoughts,” Washington Governor Jay Inslee wrote in a Twitter message. The mayor of one of the towns through which the rerouted trains travel warned earlier this month that the high-speed trains were dangerously close to cars and pedestrians. “Come back when there is that accident, and try to justify not putting in those safety enhancements, or you can go back now and advocate for the money to do it, because this project was never needed and endangers our citizens,” Lakewood Mayor Don Anderson told transportation officials in early December, according to Seattle’s KOMO News.